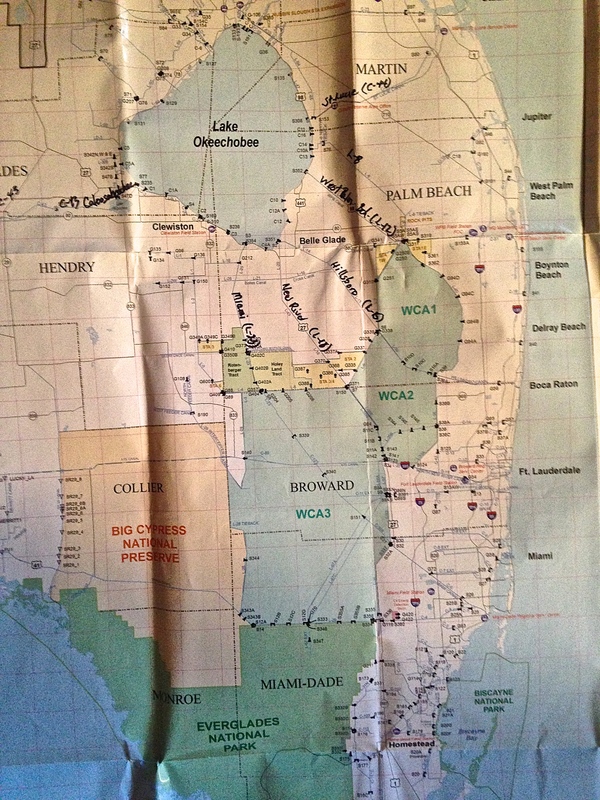 I, probably like you, know people who grew up in Miami, Ft. Lauderdale, or Palm Beach County who have moved to Martin County to get away from the over-development and traffic nightmare of “down south.” Many tell stories about things changing “overnight,” and no longer recognizing the place they called home. 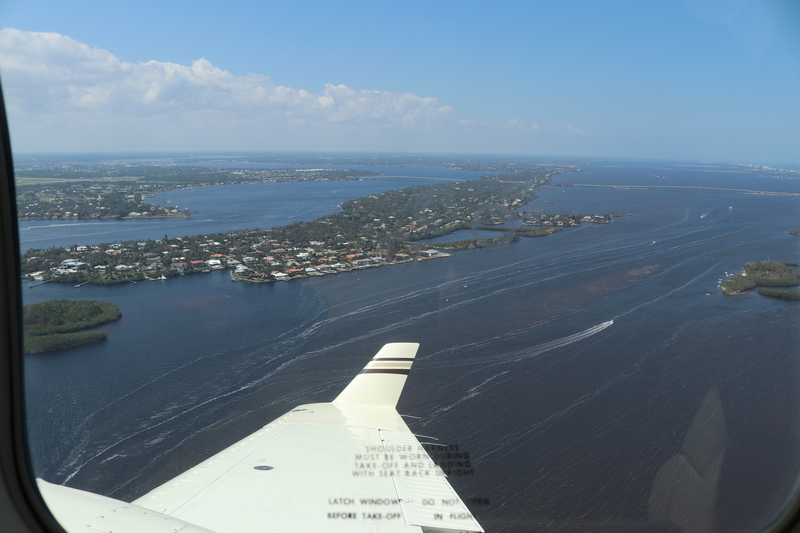 Ed’s tour-view, from the air, really makes the comparison hit home. 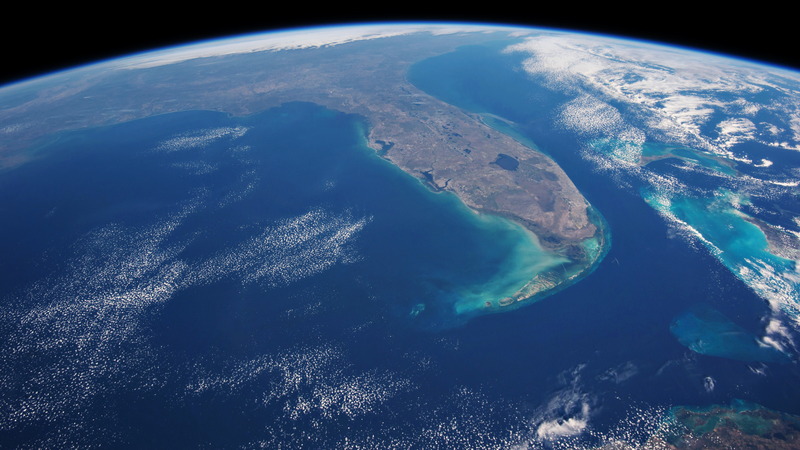 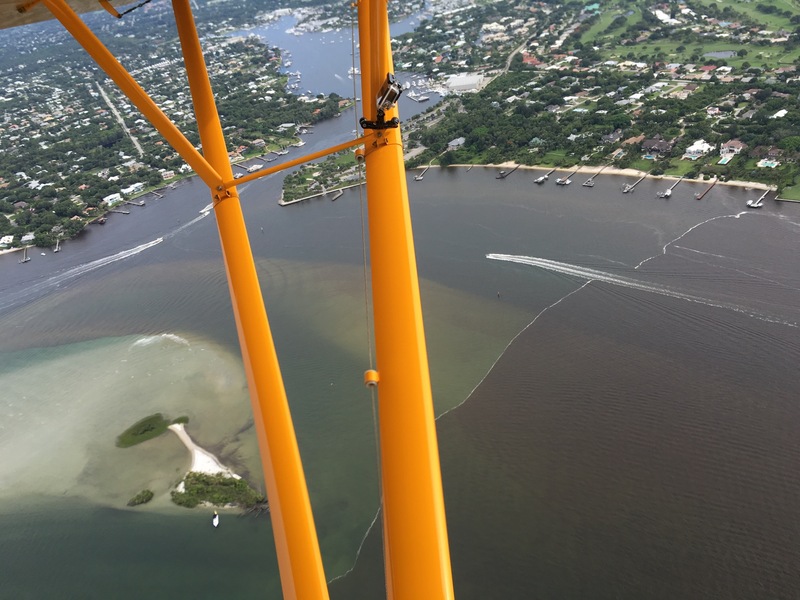 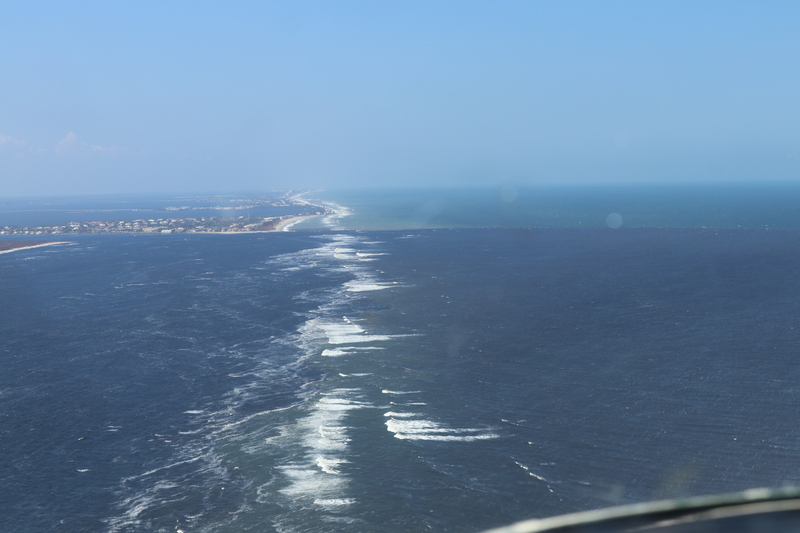 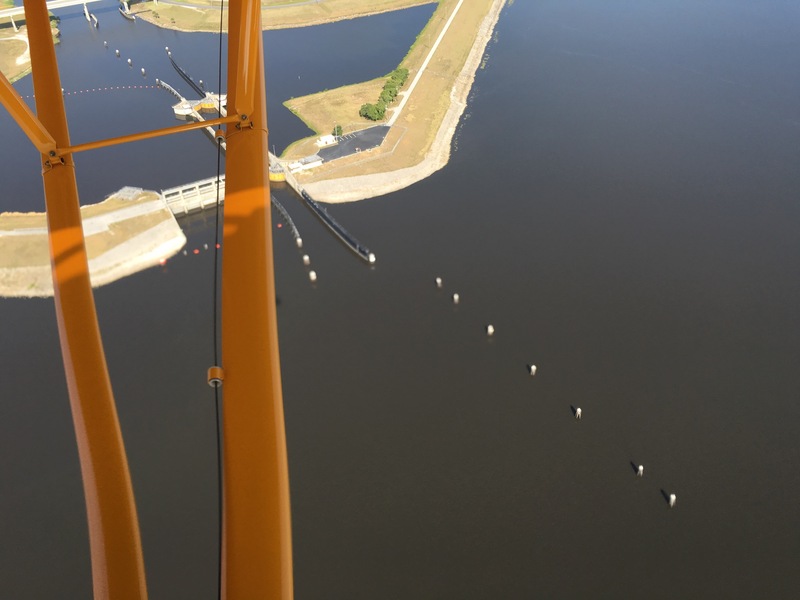 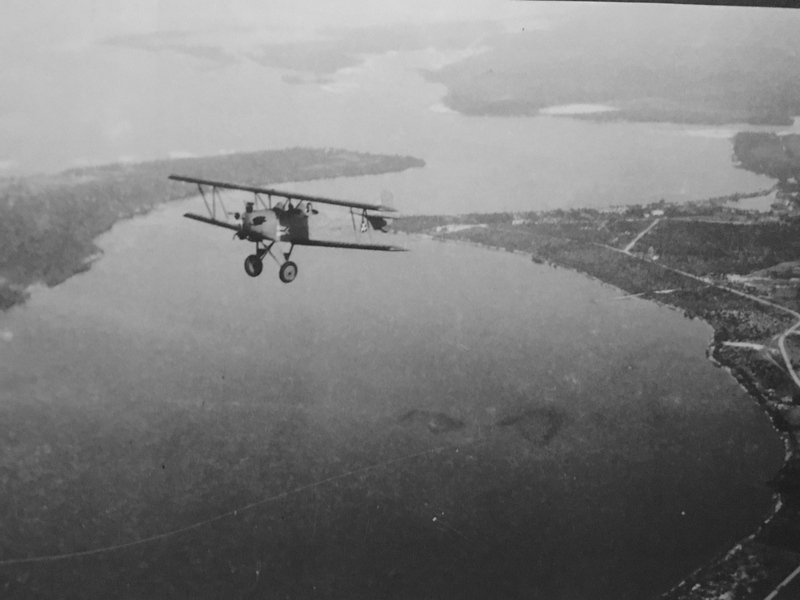 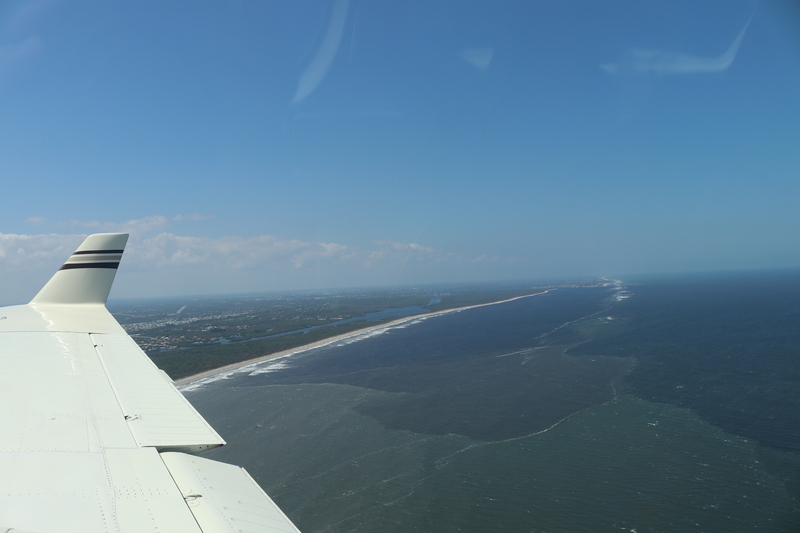 Coastal flight from Stuart/Palm City/Hobe Sound in Martin County to Miami and Key Biscayne. 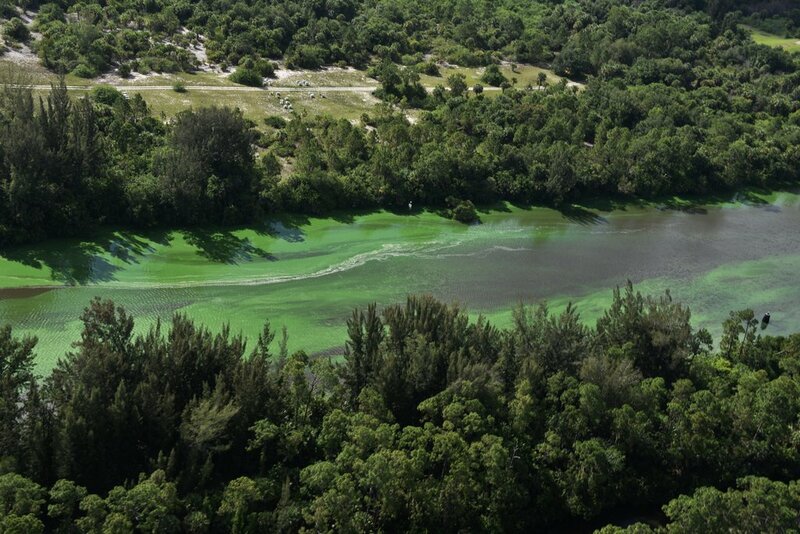 Eutrophication: (Ecology.) 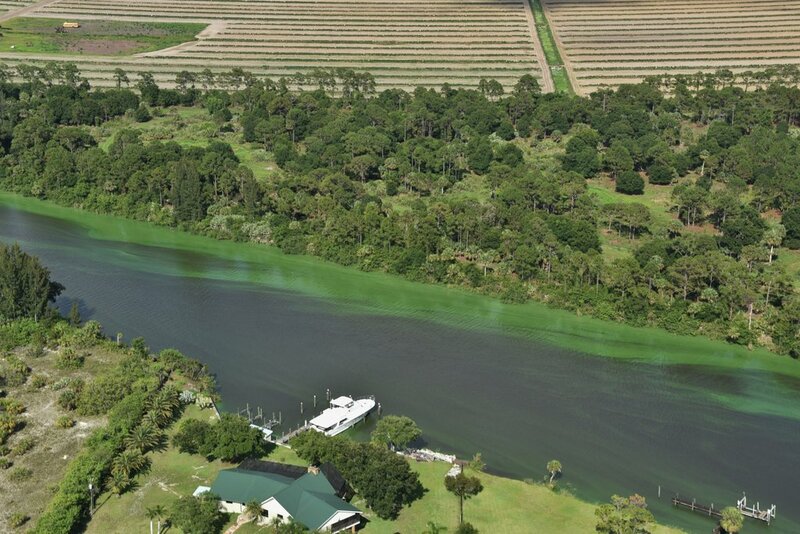 (of a lake) characterized by an abundant accumulation of nutrients that support a dense growth of algae and other organisms, the decay of which depletes the shallow waters of oxygen in summer. 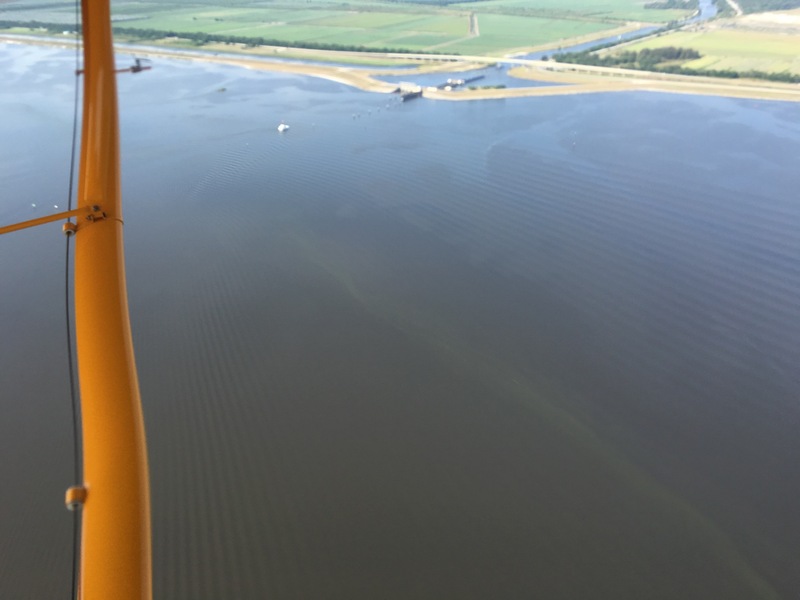 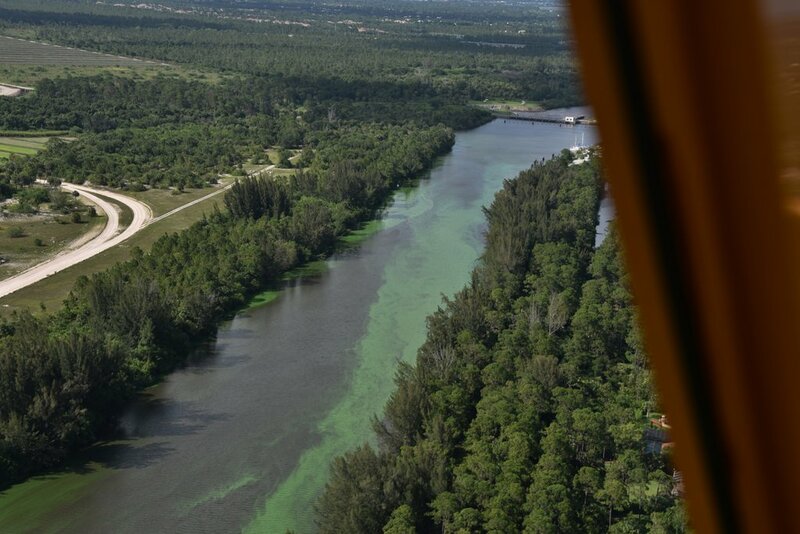 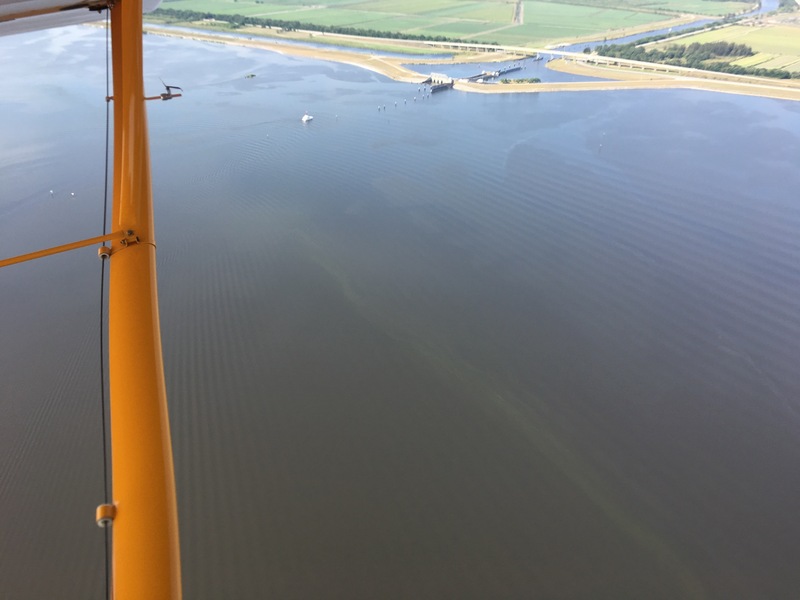 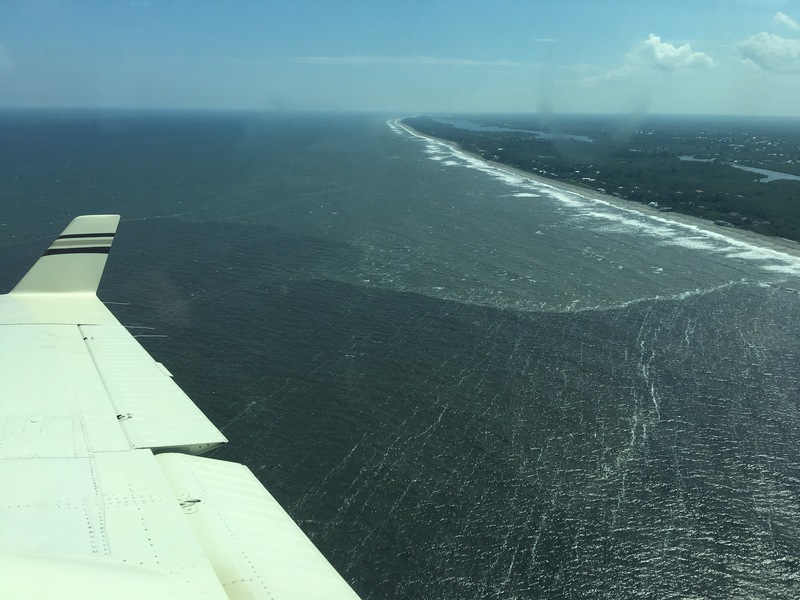 Today’s blog shares new aerial photos by Dr Scott Kuhns taken 6-22-16 of the extensive blue-green algae cyanobacteria bloom on the western side of the C-44 Canal being sent through S-80. 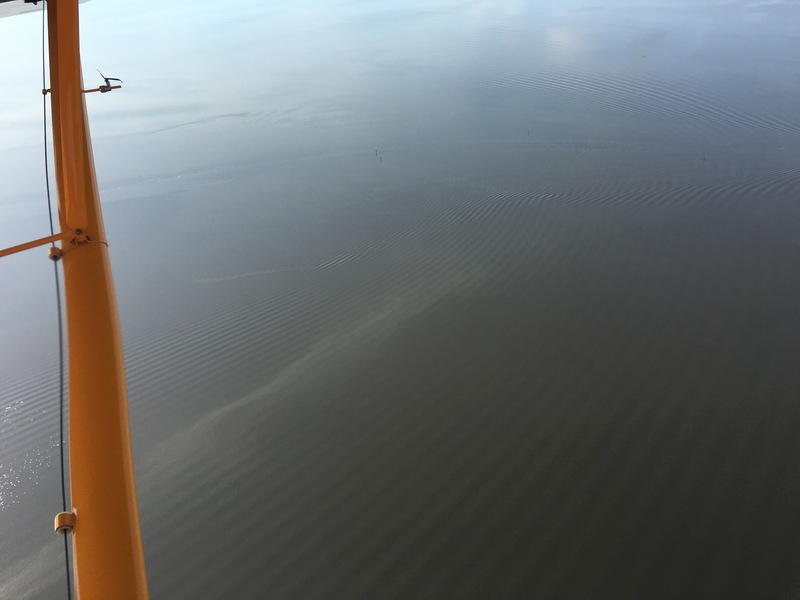 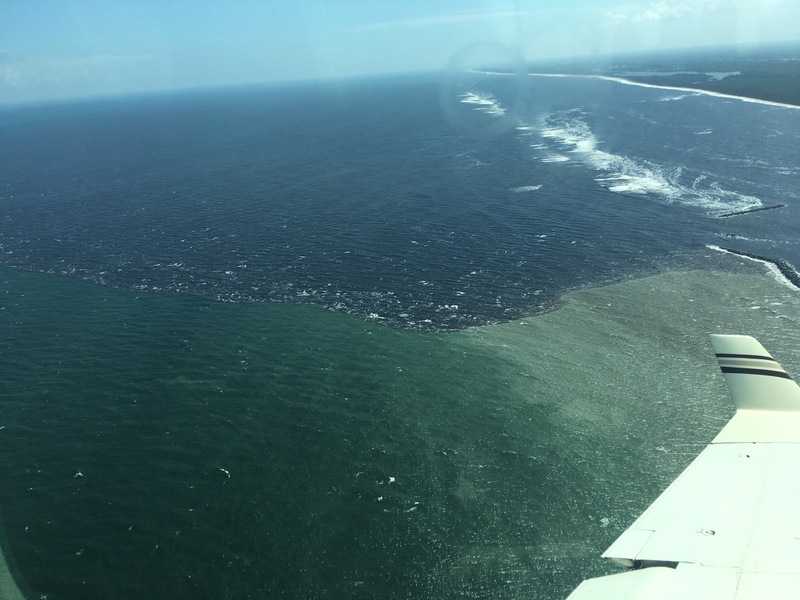 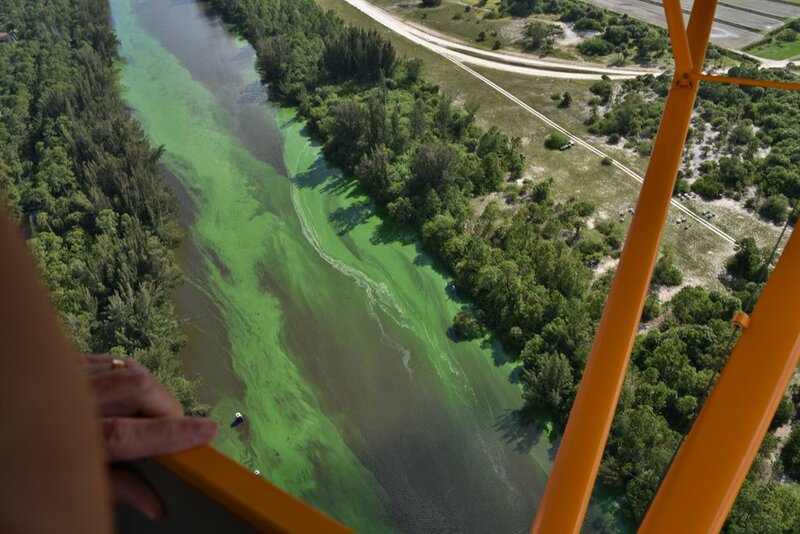 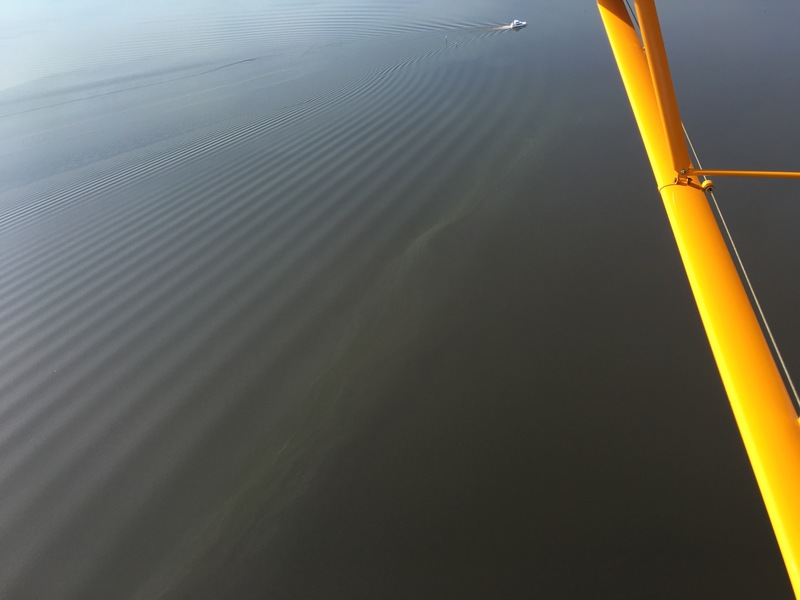 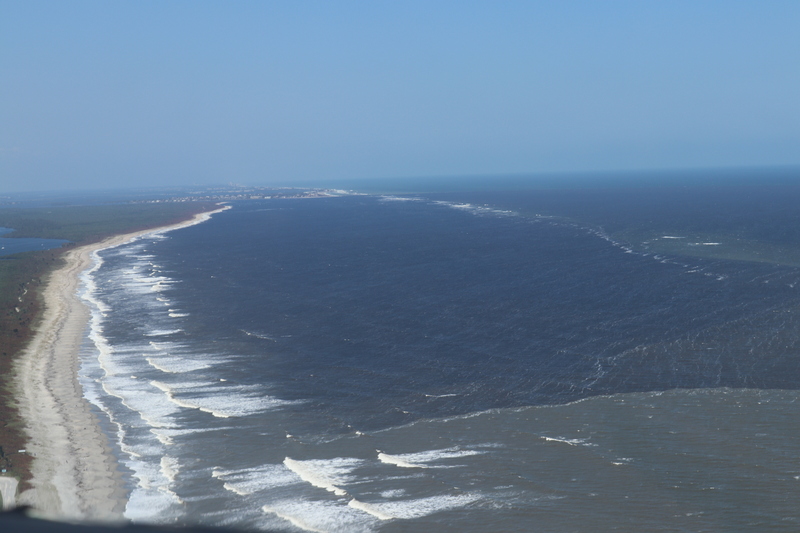 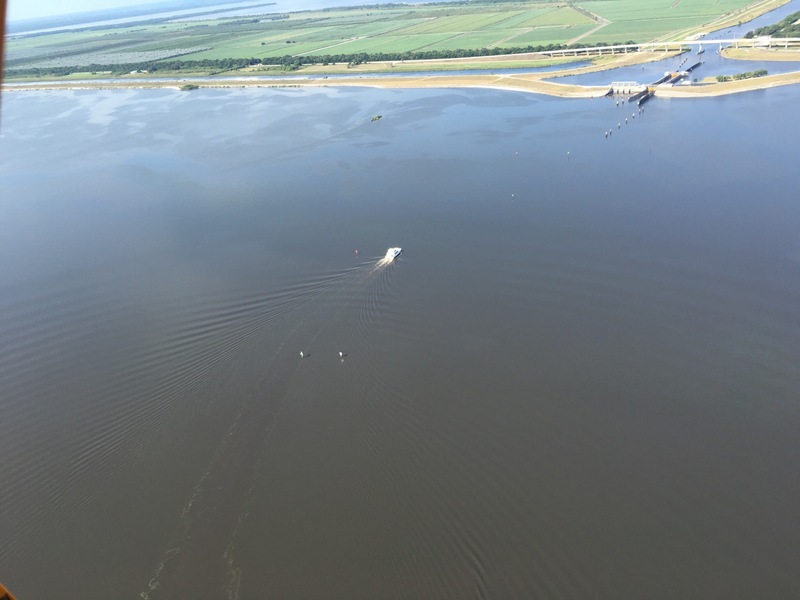 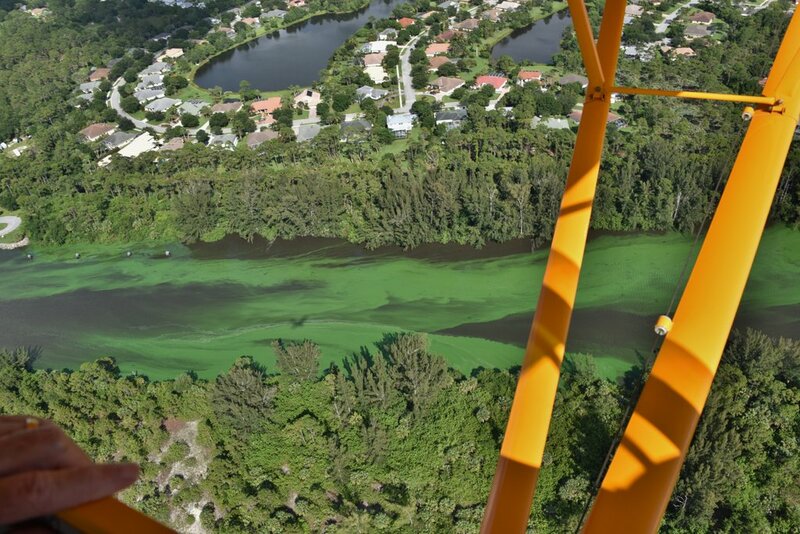 The photos show a condition caused by mixture of polluted Lake Okeechobee and C-44 agricultural basin water filled with an overabundance of nitrogen and phosphorus primarily from decades of intense agricultural farming north, south and around Lake Okeechobee. 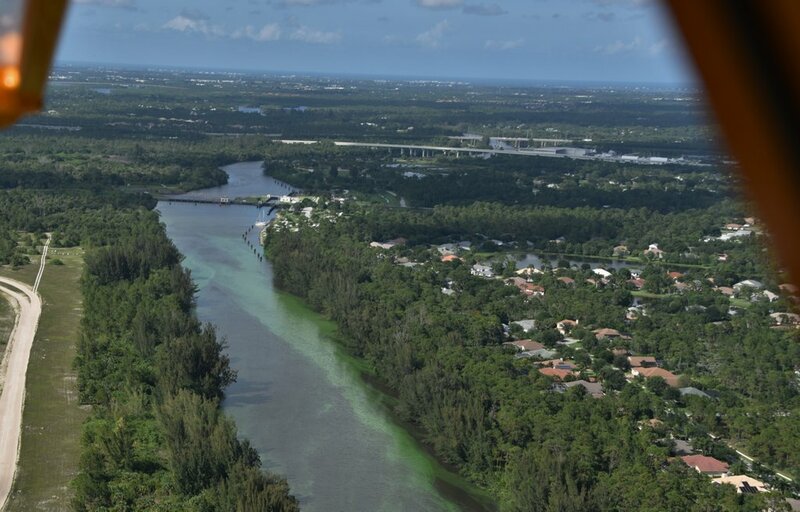 Scientists have documented this condition of “eutrophication” since the late 1960s and predicted it would worsen unless serious corrections were put in place. 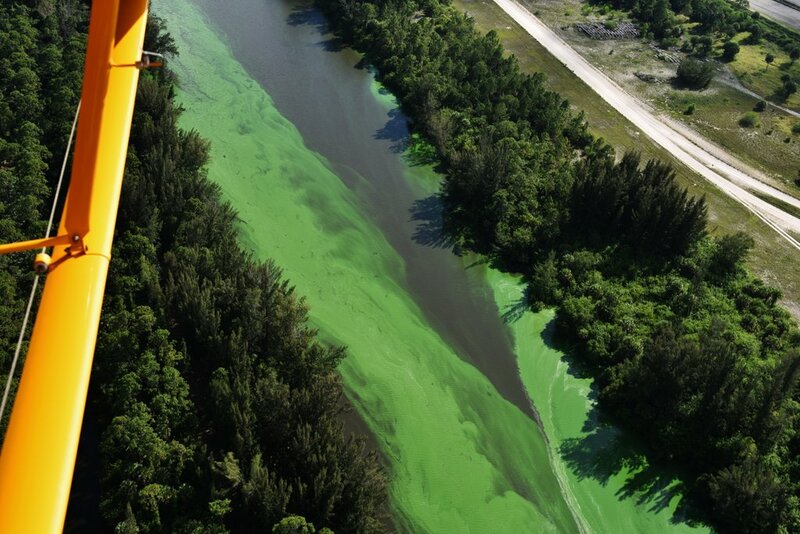 These nutrients, now out of control, feed algae blooms and have caused the eutrophication (or overabundance of algae growth) of Lake Okeechobee. 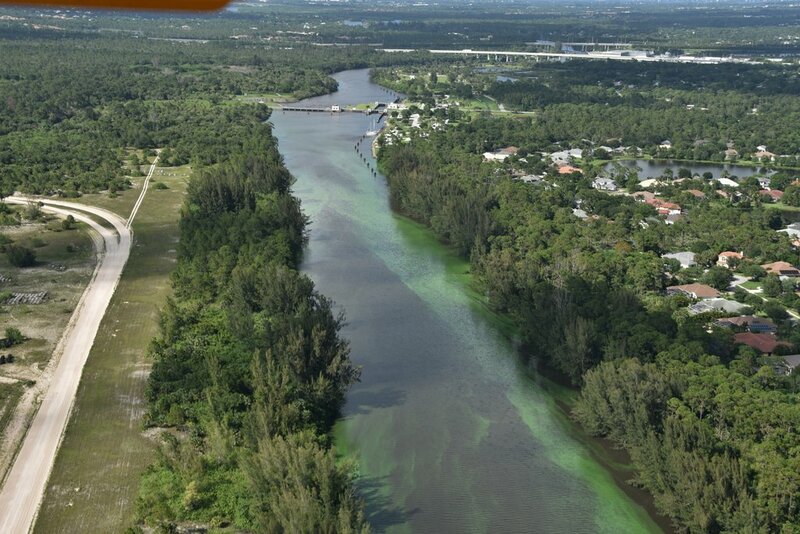 The St Lucie River is now experiencing this due to our manmade connection to the lake. 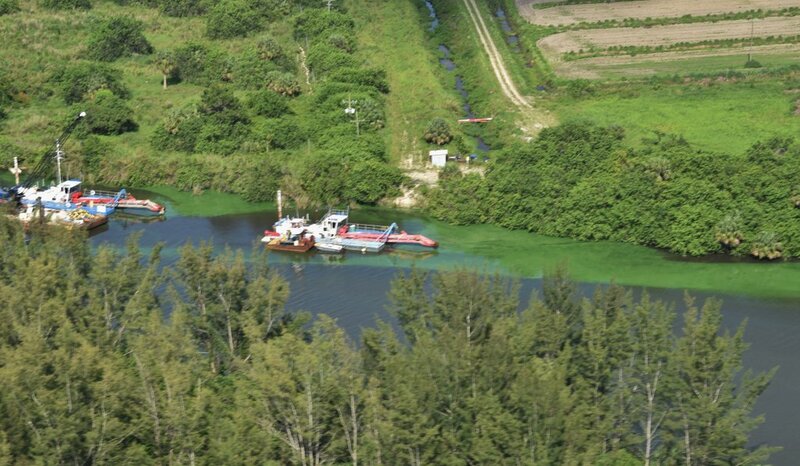 Our agricultural canals of C-44, C-23, C-24, and C-25 are culprits too. 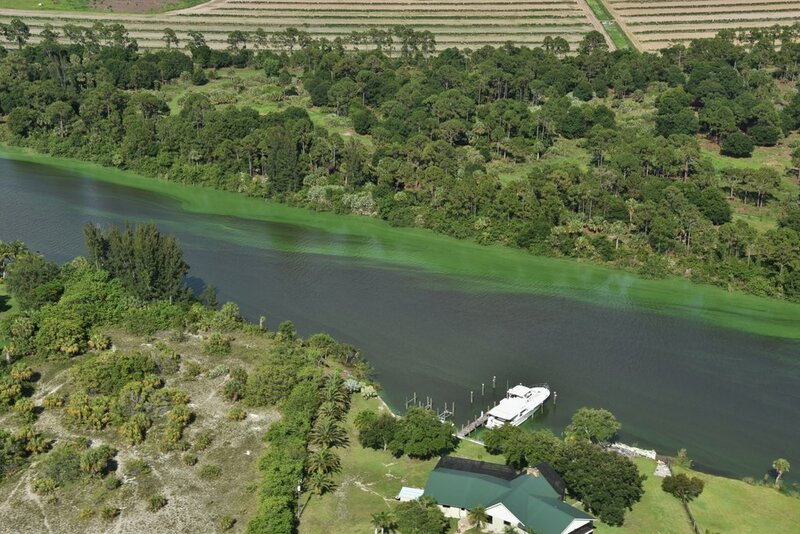 The giant releases from the lake and canals make our river fresh and seeded with algae water. 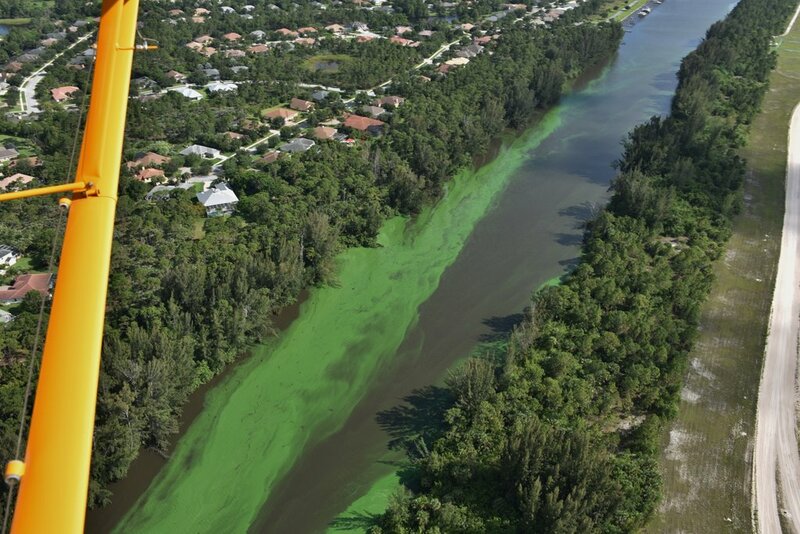 Sometimes growing toxic. 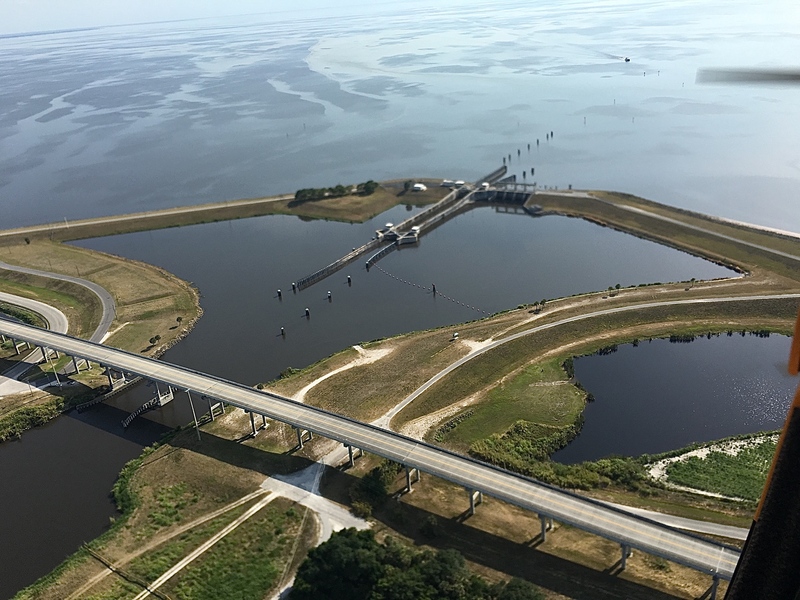 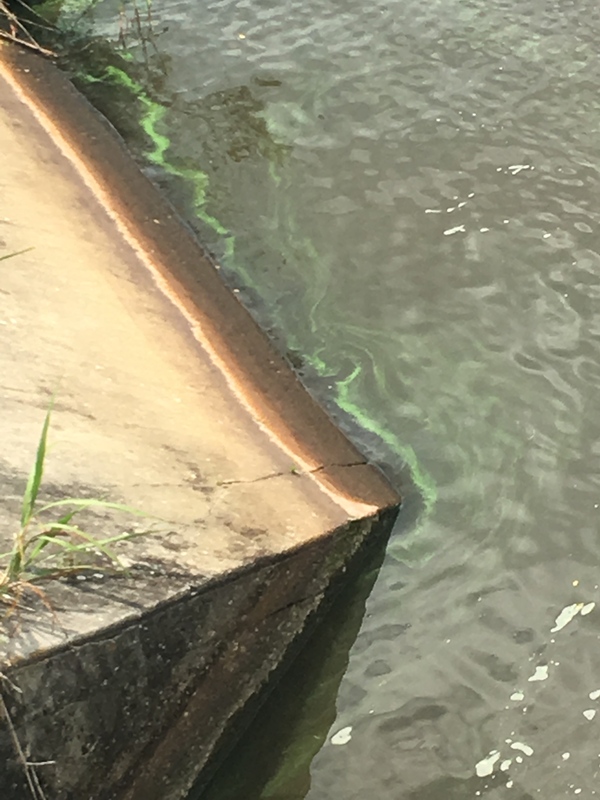 The bloom on the west side of S-80 at St Lucie Locks and Dam was first documented by local activist this time in late May. 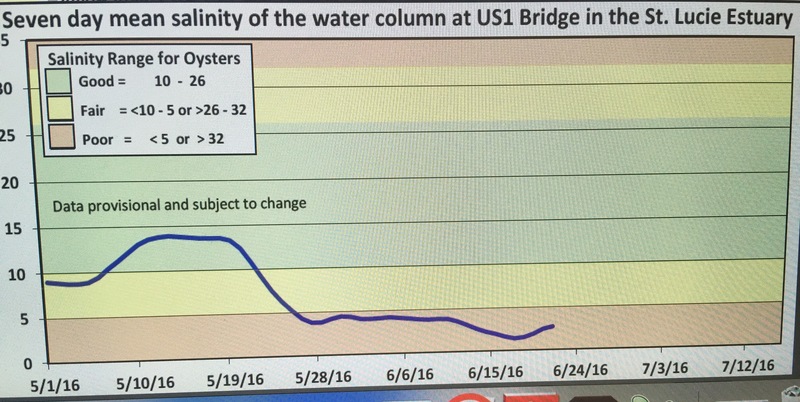 The ACOE has been dumping since January 29, 2016. 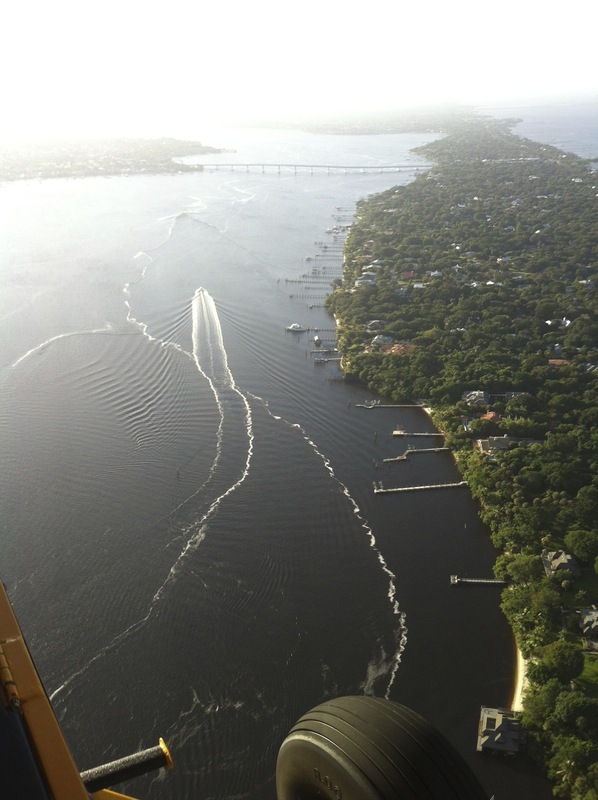 The river is now almost entirely fresh. 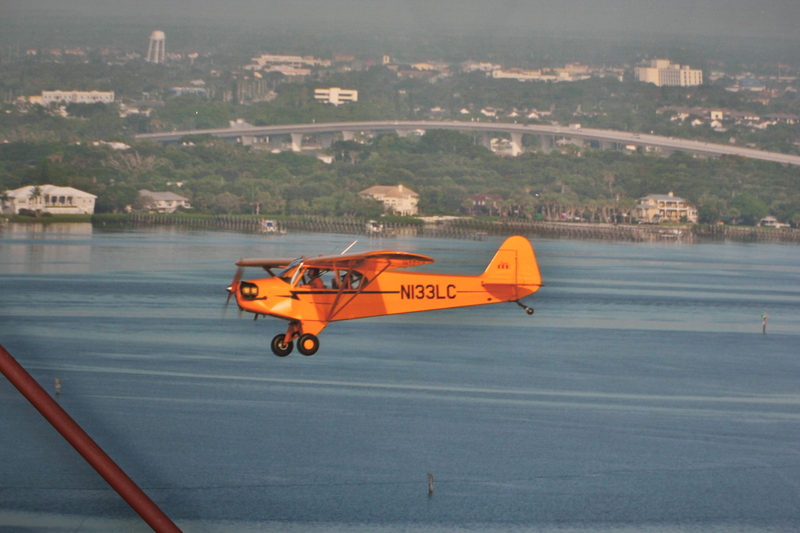 Perfect for blooms. 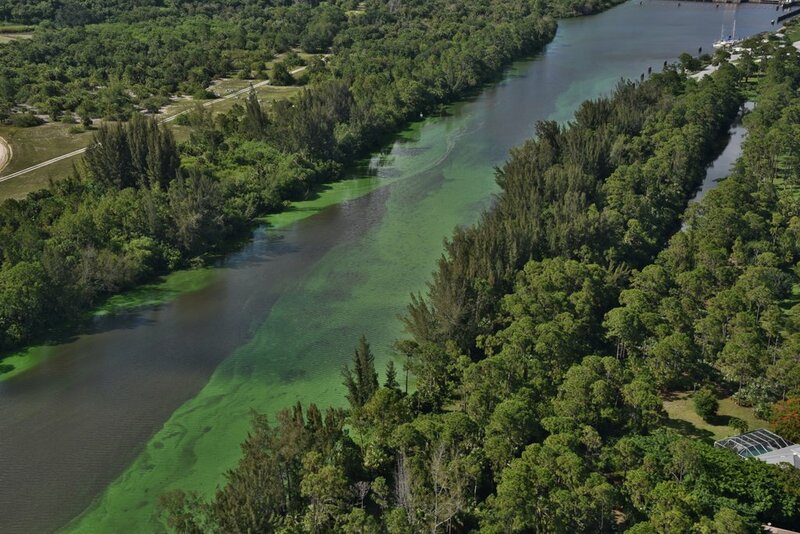 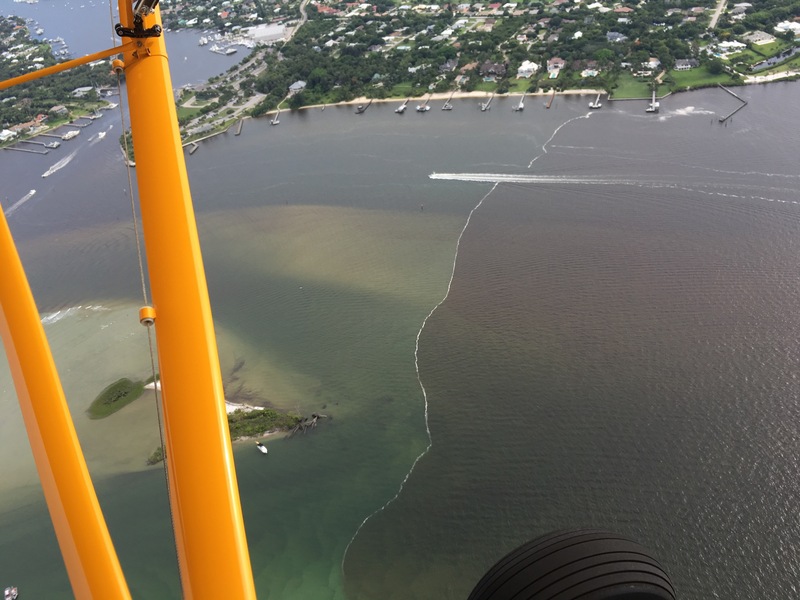 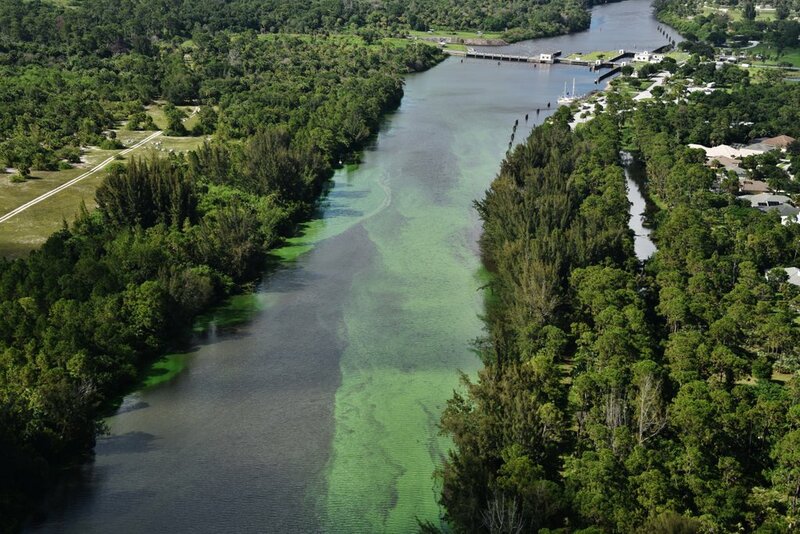 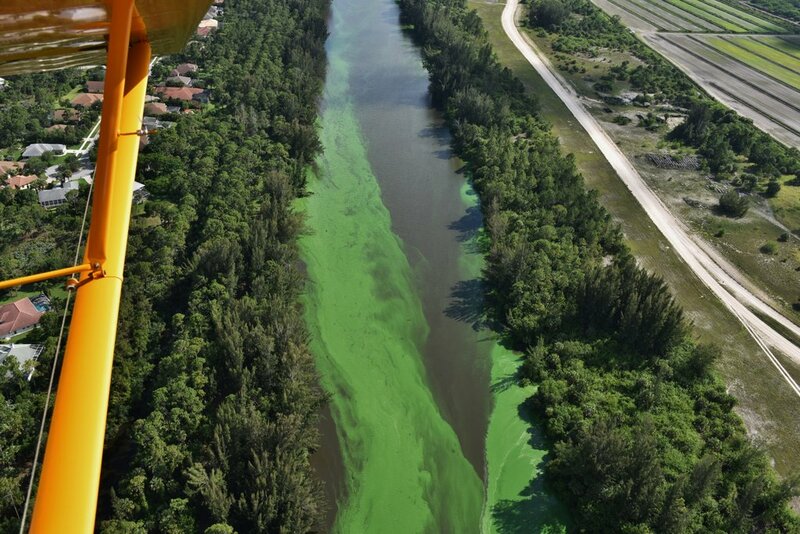 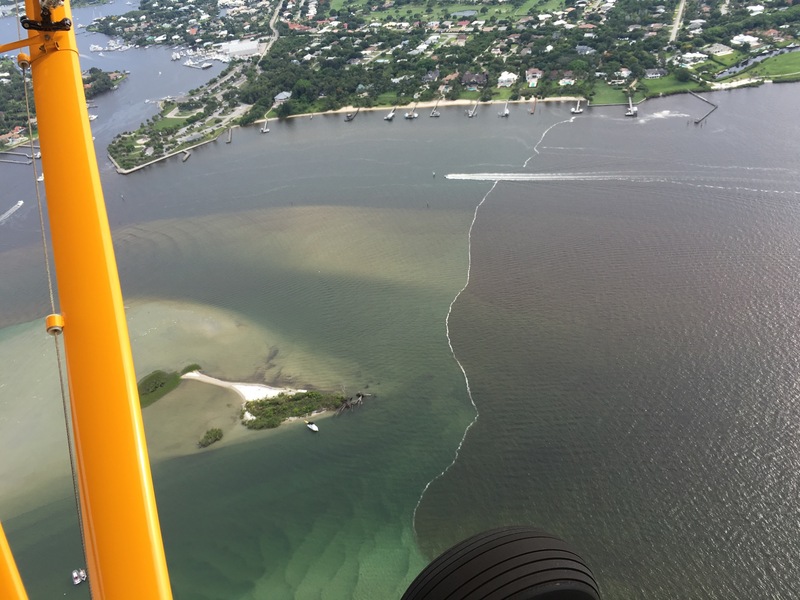 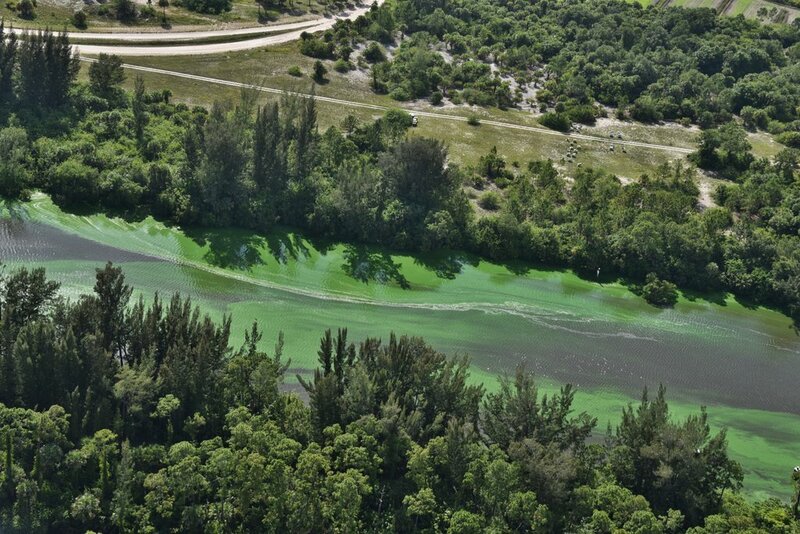 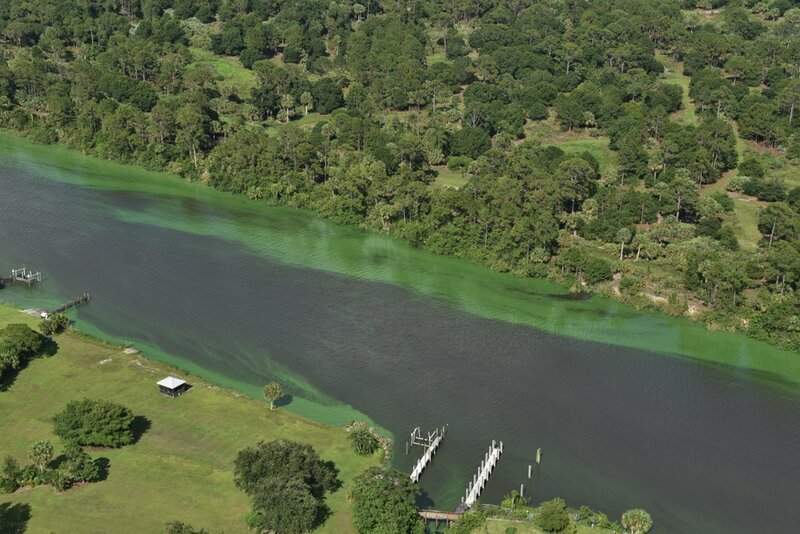 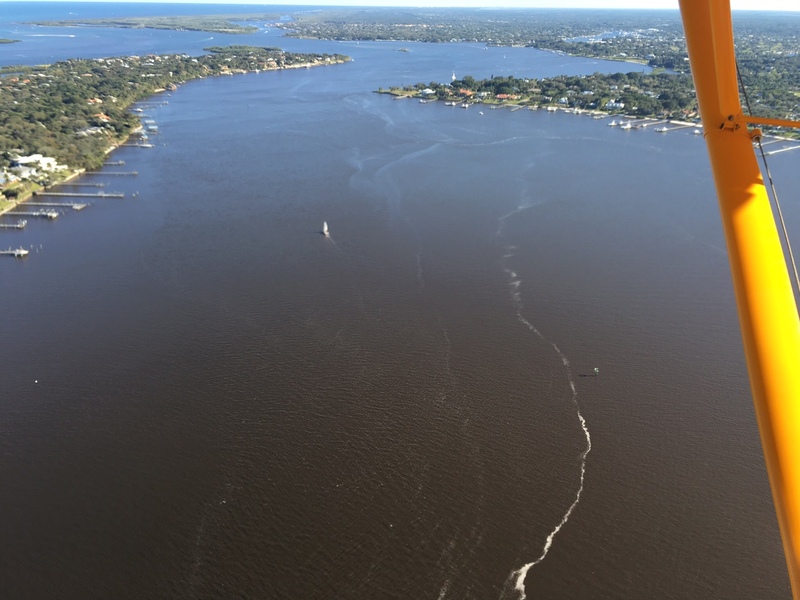 Yesterday the St Lucie River went up in algae with multiple reports throughout the entire river from Palm City, Rio, Stuart, Jensen, and Sewall’s Point. 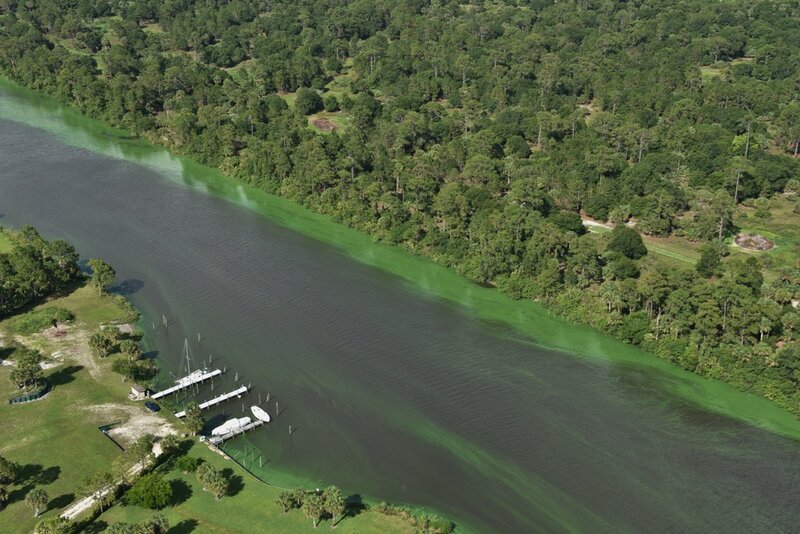 Could there be a correlation considering the bloom started in the eutrophic lake ? 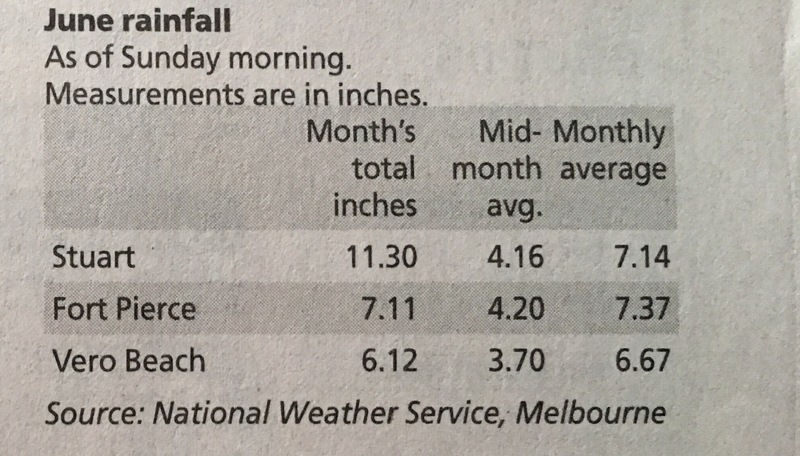 How could there not be. 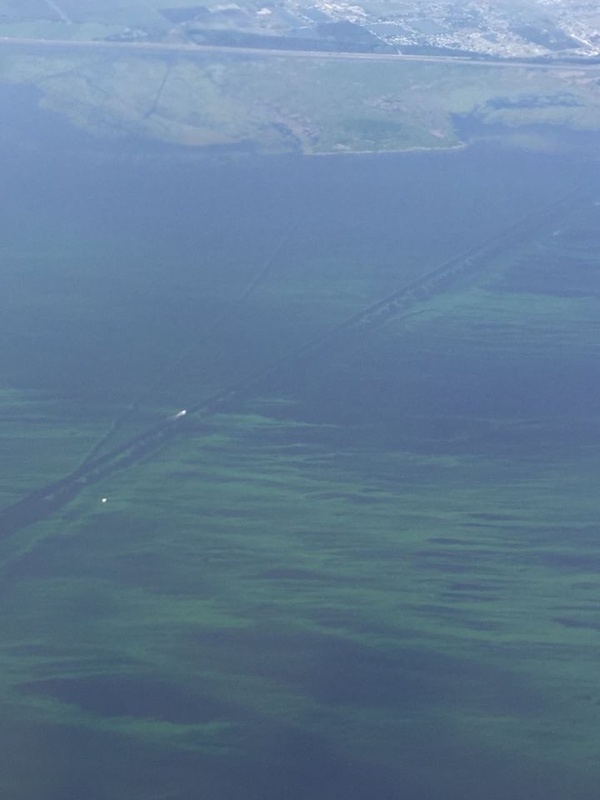 We should not be connected to the lake. 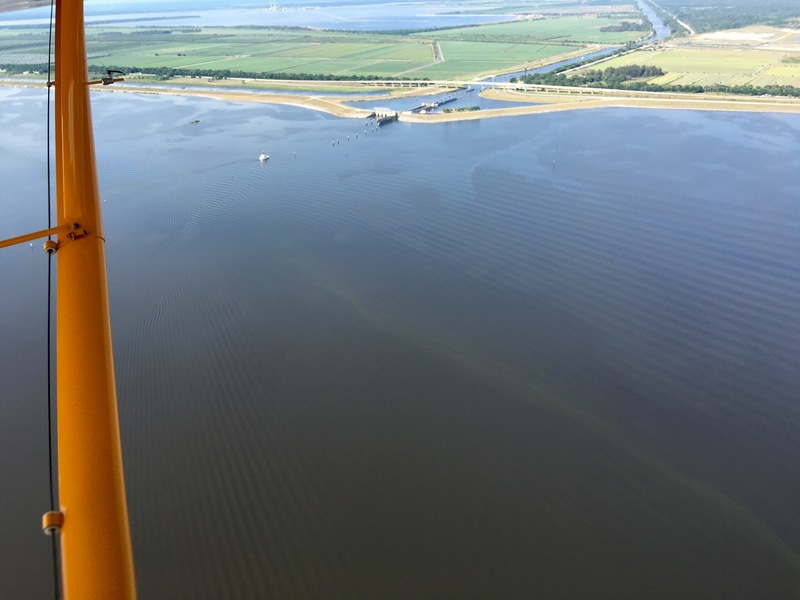 Agricultural canals should be redirected. 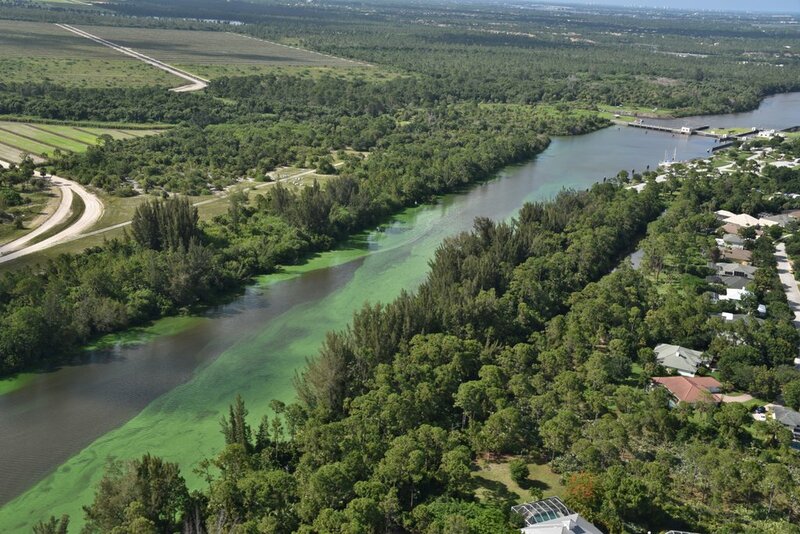 There must be storage to treat this algae water. 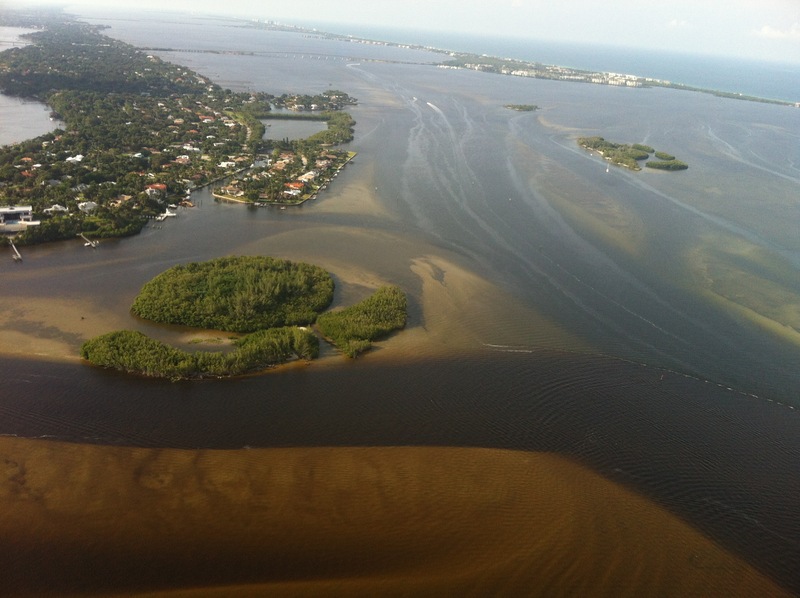 It should not be sent into our estuary destroying property and the environment. 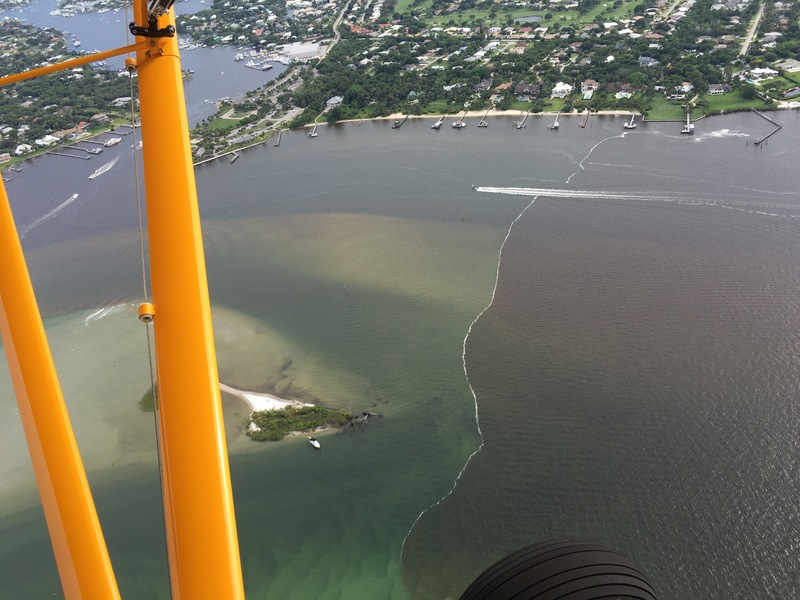 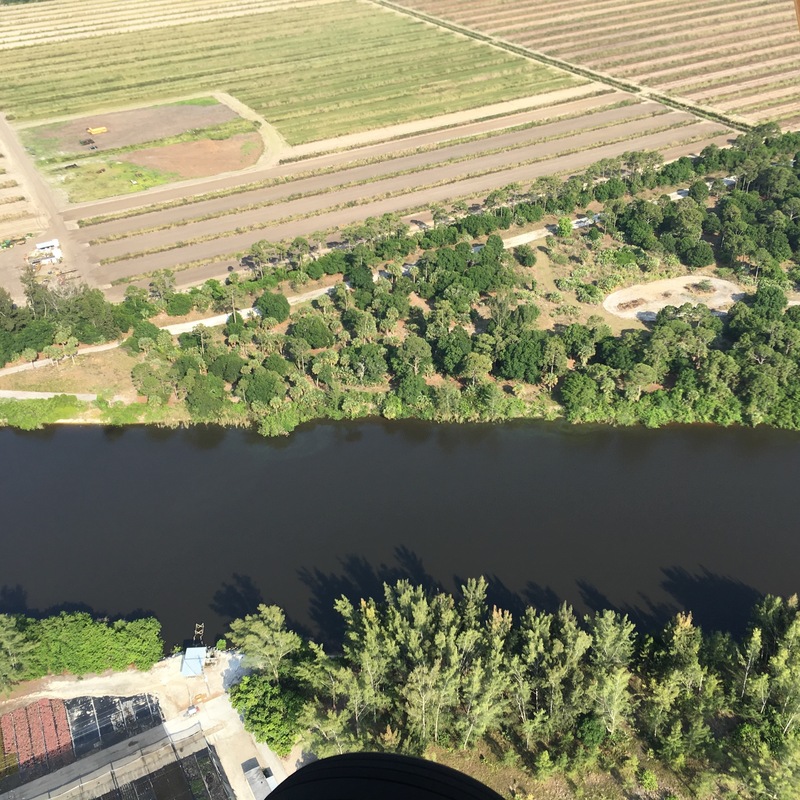 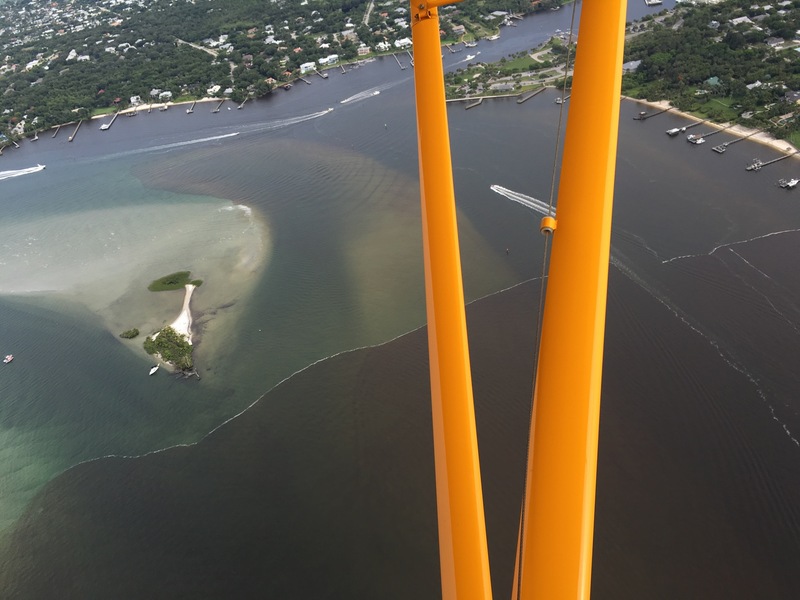 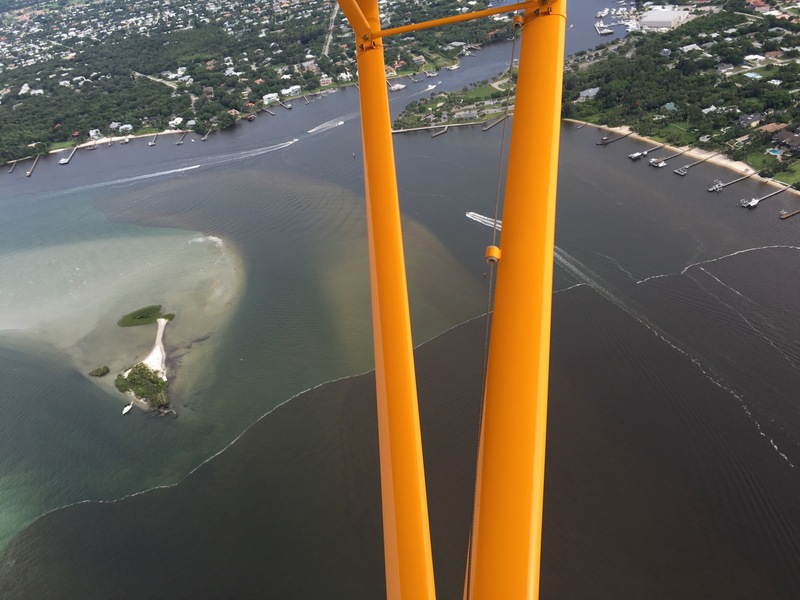 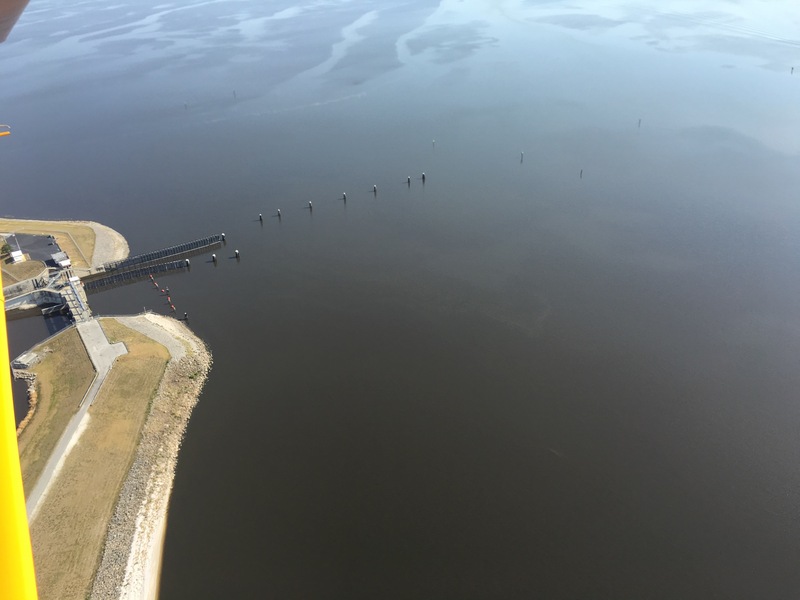 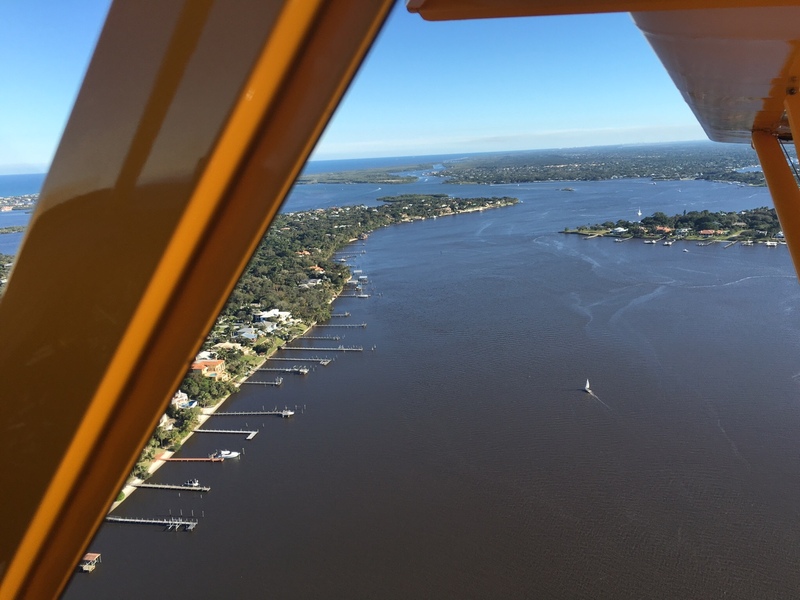 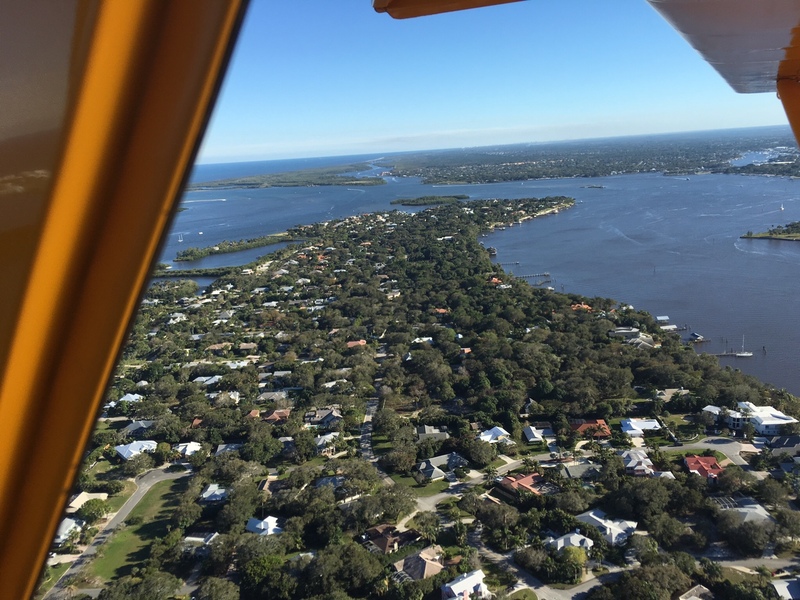 Today I will share aerial photos of the Manatee Pocket area around Sandsprit Park taken yesterday by my husband, Ed Lippisch, and a short written update by Dr Gary Goforth dated 6-12-16. 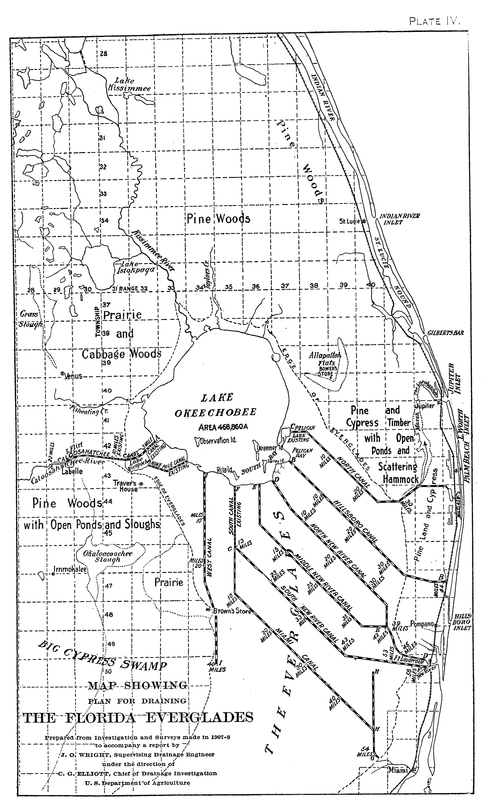 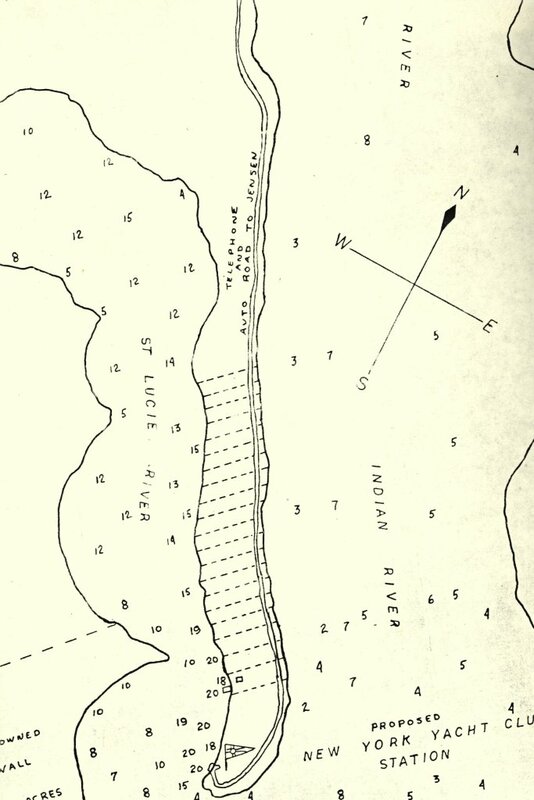 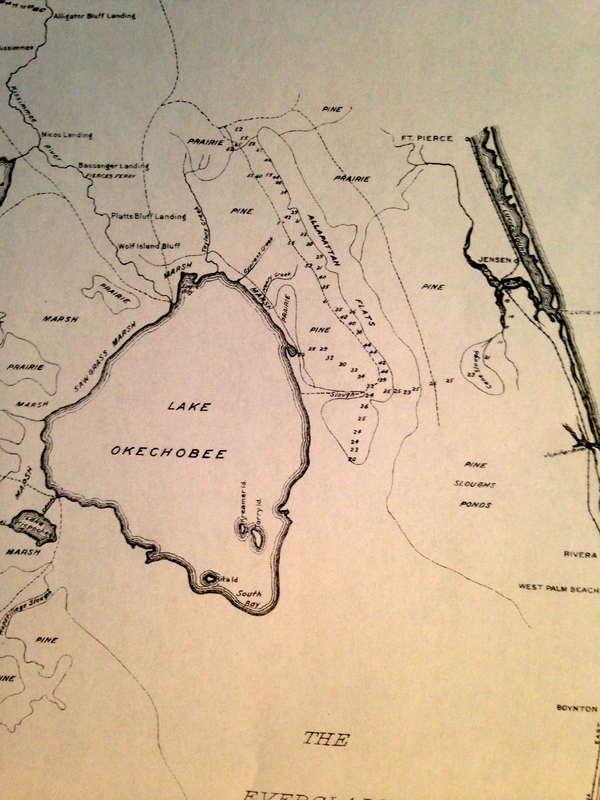 Manatee Pocket lies close to the St Lucie Inlet just across from Sewall’s Point. 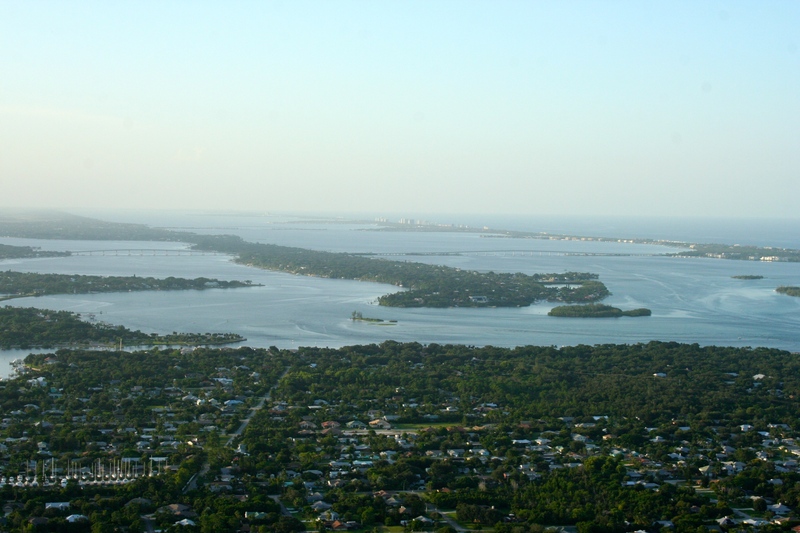 It once was the mecca for the St Lucie River/Indian River Lagoon commercial fishing business. 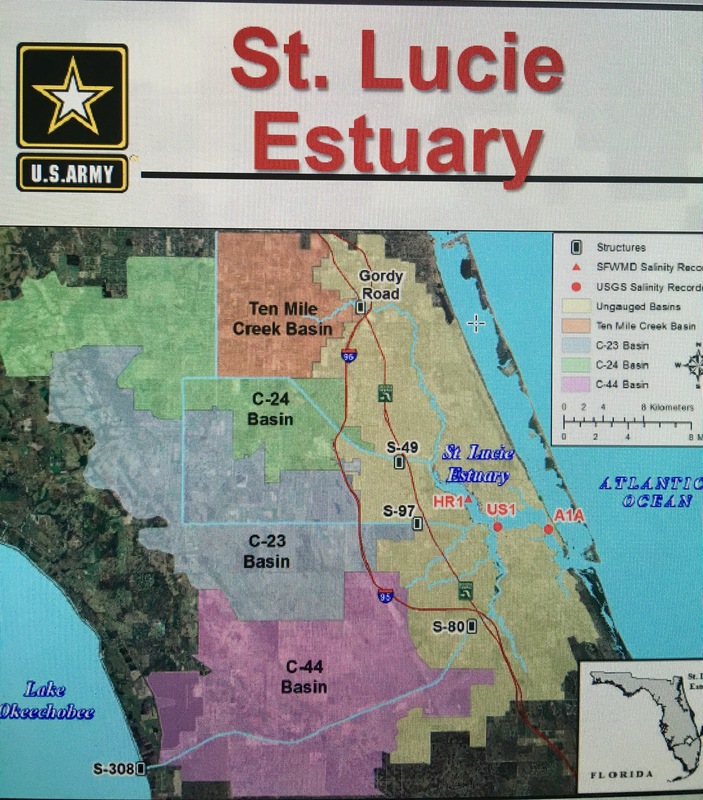 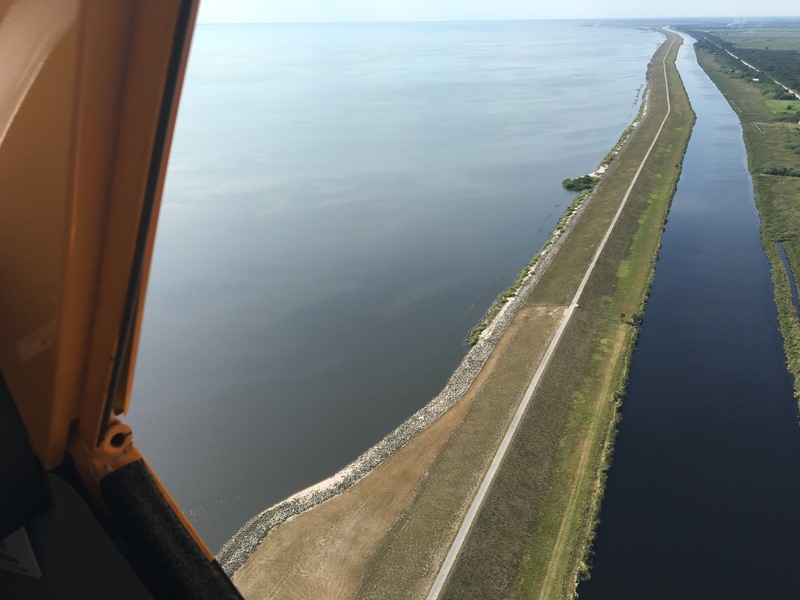 The Lake Okeechobee discharges continue having started by the Army Corp of Engineers January 29th of this year and are approaching the level for all of 2013. 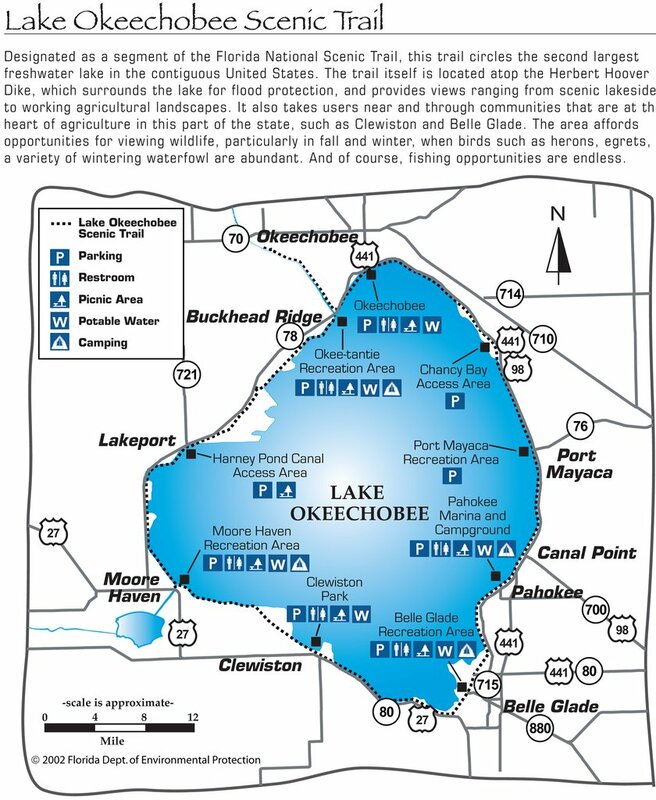 Lake Okeechobee yesterday was reported to stand at a very high for this time of year 14.77 feet—-There is no end to discharges in sight for the St Lucie River. 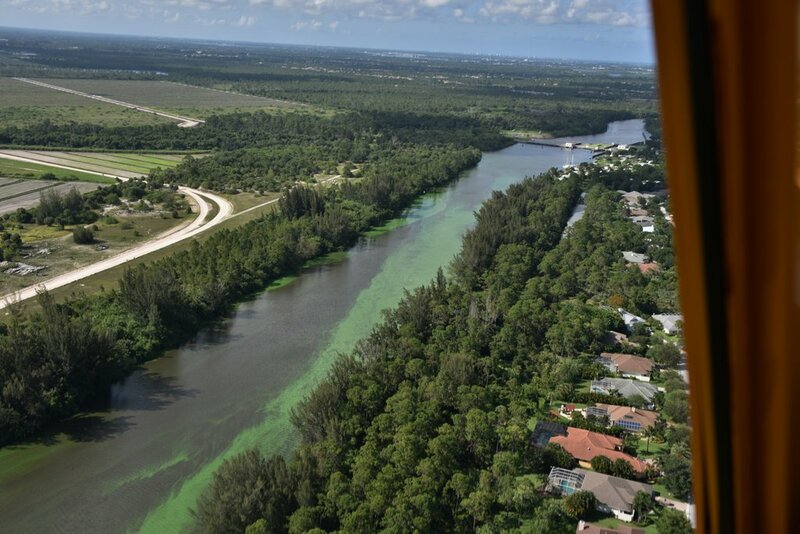 Conditions are very bad and the state and federal government are stuck in a pattern that is killing our quality of life and economy. 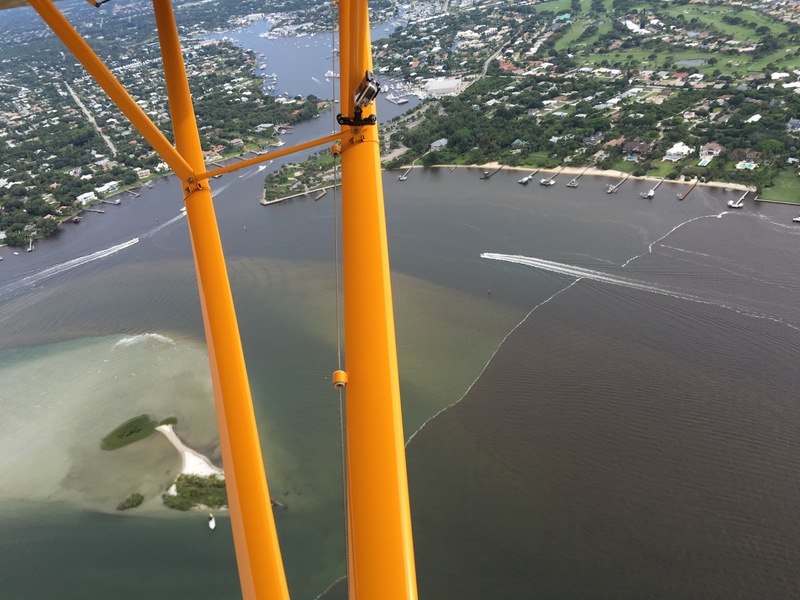 Photos of SLR at Manatee Pocket, Ed Lippisch, 6-15-16.